2. In the very first tests (in console based version of this app) it worked in Waffles.fm, so this version should still work there. 3. I will appreciate if you test the app and send me feedbacks in the forum (http://nrpg.forumer.com/) in the feedbacks, please include screenshot, the torrent file and the information from the white text box (if any). 4. 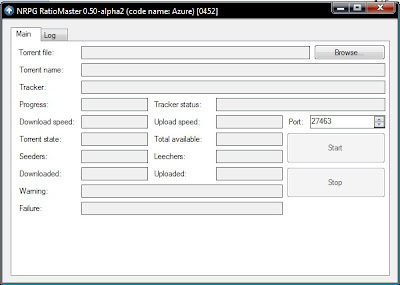 This version is numbered 0.50-alpha1 (don't mess it with other versions) and the code name of the project is "Azure"
1. Click "Browse..." and select torrent file. NRPG RatioMaster 0.50 (code name: Azure) public alpha and beta versions for test. Full program title "NRPG RatioMaster 0.50-alpha2 (code name: Azure) "